It’s been more than 60 days since the state government imposed a ban on the use of plastic carry bags below 50 microns. The Panjim municipal market has seen a change as large vendors have stopped its disbursement to customers. As part of its ‘plastic-free Goa’ mission, the government in April announced banning the use of all plastic carry bags less than 50 microns thick, starting with Panjim, Mapusa and Margao. The stricter implementation of the Plastic Waste Management Rules 2016 has seen several traders, particularly vegetable vendors discouraging the use of environmentally-hazardous material while few others have resorted to above 50 microns thick plastics. Mohd Arman, a fish vendor expressed helplessness to implement a blanket ban on plastic bags citing non-cooperation from many customers. “We get many customers who do not get their own bags while they come to buy fish, and it does not make sense to wrap sea food in papers or cloth bags, as it would leak. Therefore, plastic bags are used but we ensure it is above 50 microns,” he said. Some fish vendors however give plastic bags despite customers carrying their own while there have also been instances wherein vendors clandestinely distribute/sell plastic carry bags below 50 microns. One such example is of some women vendors selling clams (tisreo). “They give clams in a thin, transparent like plastic bags. There is no check. Some of us who carry our own plastic bags are still given an additional bag from these fish vendors although we deny it. Similarly, women selling clams are stacked with less than 50 microns plastic carry bags despite knowing it is illegal,” said Tina Naik Gaonkar, a local resident. On the other hand, the vegetable vendors, to a larger extend, have nearly stopped selling/ distributing or stocking below 50 microns plastics. In many cases, they do not encourage any kind of plastic bags. “If my customers do not get their own bags, I give them the vegetables wrapped in papers or ask them to buy cloth bags. 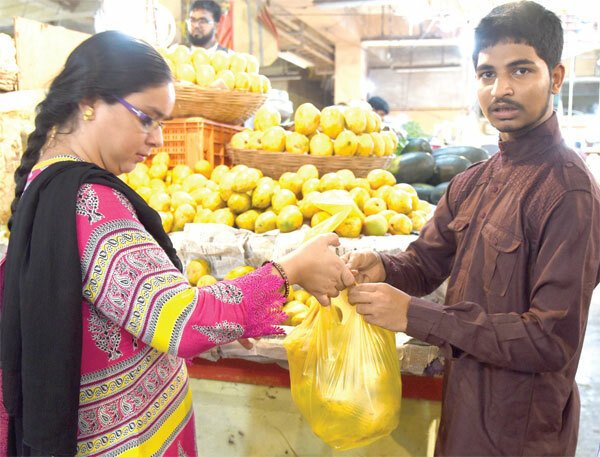 I have completely stopped the use of all kinds of plastics,” Suleman Malik, a vegetable vendor said. Herald also spoke to the Panjim market tenants association President Rajendra Dhamaskar who ascertained that many vendors in the municipal market are strictly abiding by the government directions.